CBD Oil Review rates Thoughtcloud CBD with four stars because it qualifies for the Quality, Charity, Mission & Innovation Badges. Level up! That’s what’s happening with Thoughtcloud, a sophisticated innovator with products that dominate. We’re talking ozonated molecules, high concentrations of lesser-known, powerhouse cannabinoids, and prime healing ingredients wielded by holistic experts. Any discerning consumer in the holistic space will recognize this brand’s superiority. They fall just short of a five-star rating by failing to post online test results, but other than that, Thoughtcloud earns high marks from us as a trustworthy and charitable organization. 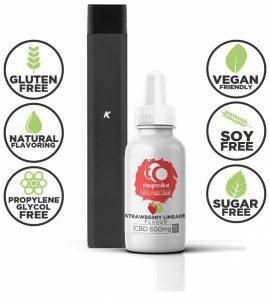 Get high-quality CBD oil from Thoughtcloud CBD! 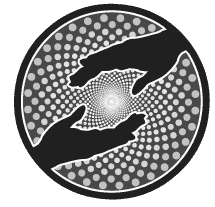 Leo Pena, a longtime practitioner of holistic medicine, started Thoughtcloud in 2017, and his expertise in natural healing shows in the carefully selected and innovative ingredients that accompany CBD in many of their products. The methodology of holistic medicine to treat the system, not just the systems, underpins their formulation process. 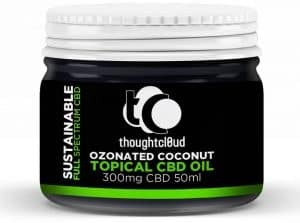 Thoughtcloud is doing very interesting and innovative things in the CBD space, like combining highly concentrated amounts of other specific cannabinoids with CBD and using ozonation in their topical line for its protecting and anti-inflammatory properties. They are committed to sustainable, clean sourcing and utilize CO2 extraction via fractional distillation in their own lab under the direction of a research team specializing in this technique. We’re a bit blown away by the product line; it’s obvious that the minds behind it are applying extensive knowledge when it comes to CBD science and holistic practices at-large. Their expertise is on another level. Thoughtcloud offers a vape line with isolate and full spectrum options, pen, and pods. They manufacture bath bombs (the first in the CBD bath bomb game) and full spectrum CBD pet tinctures. The tincture line for humans is extensive and exciting with options in naturally derived flavors, full spectrum or isolate, and carrier oils. Their specialty tincture formulations are particularly innovative and intriguing, featuring a High CBN Pain and Sleep Formula, High CBG Inflammatory and Allergy Formula, and Low Weight Persons Formula with natural grape extract geared toward little ones. We absolutely love the application of specified cannabinoids in these formulas and the lower concentrations aimed at children. Bravo. 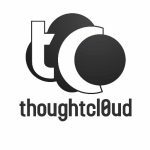 Finally, Thoughtcloud’s topical line is one of the best we’ve seen. It features a facial glaze with CBD and ozonated jojoba oil, beauty mask, full spectrum facial bar, and a pain management balm infused with robust healers like turmeric, magnesium, and valerian root. The star of the topical lineup is undoubtedly The World’s Only Ozonated CBD Topical Skin Issue Resolver. It contains a blend of CBD and coconut oil infused with ozone bubbles to ameliorate acne, fungus, psoriasis, and a slew of other skin problems. Thoughtcloud’s use of ozonation and their introduction of the CBD bath bomb make them easy recipients of the Innovation Badge. Their charitable endeavors are extensive and legitimate, from scholarships to hardship assistance and nonprofit donations. We are disappointed that they do not post online laboratory results, as this disqualifies them from the Safety Badge. Bottom Line – Thoughtcloud will appeal to any educated consumer in the holistic space: these people know what they’re doing and they’re executing brilliantly. All we need to see is online test results of their products and BOOM! You’ll be looking at an industry leader at the top of their game. Thoughtcloud sources sustainably harvested, non-GMO hemp grown organically in Colorado and utilizes clean CO2 extraction. Thoughtcloud has a scholarship program for veterans in Orange County, a hardship assistance program, and a history of charitable donations. Thoughtcloud is dedicated to producing sustainable, organic formulations to improve immunity, support metabolic homeostasis, and enhance mental health. 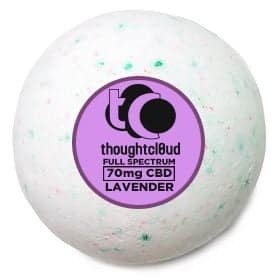 Thoughtcloud originated the CBD bath bomb and uses innovative ingredients in their products such as ozonated formulations and high concentrations of isolated cannabinoids other than CBD.